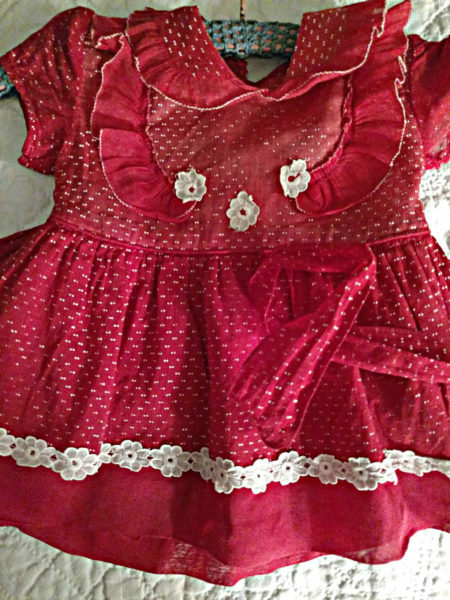 An adorable Christmas red baby dress, vintage 1950’s. Nanette Original Size 1. Dress your little miss in this cute dress for vintage Christmas photo op. This sweet dress, in a dotted Swiss and plain red fabric, features a peter pan collar with pleated ruffle edge. This same ruffle is used on the front bodice of dress, embellished with three white “flower” appliques. Short puff sleeves. Button down the back with three buttons. The skirt is made in an apron affect with the dotted Swiss.